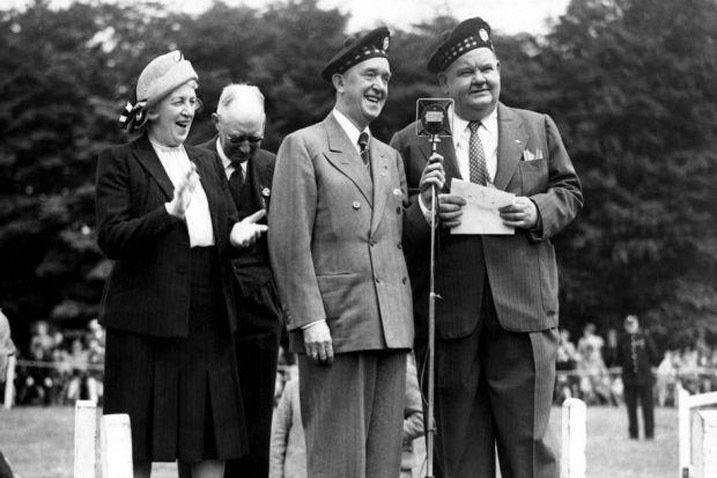 Stan Laurel and Oliver Hardy in Giffnock, Glasgow in 1947. CINEMAS are once-again packing them in to see a new Laurel and Hardy film. While fans flock to see the acclaimed biopic, Stan & Ollie, which features the comic duo playing in Scotland, the bowler-hatted pair had far stronger Caledonian links. Stan Laurel spent much of his childhood in Glasgow and his mum, Margaret Jefferson, is buried in Cathcart cemetery on the southside of the city. Her grave is unmarked and overgrown but Cassidy Cook, Stan’s great-grand-daughter and owner of the much-loved entertainer’s estate and archives, intends to change that. Yesterday, speaking from her home in California, she revealed plans to visit Scotland this summer to pay tribute to Stan’s Scots legacy and unveil a new headstone on his mum’s grave. Cassidy – who was told about the grave’s condition by Ross Owen, a Laurel and Hardy expert who was a consultant on the new movie – said: “At one time I believe there was a headstone – I have paperwork which suggests there was, but maybe over time it’s been destroyed or stolen. “When Ross told me, I decided we would hold a lottery, where everyone can buy a ticket for $1, and the winner will receive a unique piece of memorabilia from our archives. I also hope the winner can be there on the day of the unveiling to place the headstone. Stan’s mum, who was known as Madge, was an actress and was often on the road, especially in his earliest years. As a result, he lived in his grandparents’ house, where he was also born, in Ulverston, while his parents were working away. During their time in Scotland, the family lived on Buchanan Drive and he went to Rutherglen Academy, now Stonelaw High. His mum suffered from ill health and died aged 48, while his dad, AJ Jefferson, who managed the Metropole theatre in Glasgow, moved back down south and married again. The trip to mark her great-great-grandmother’s grave will not be Cassidy’s first to Scotland. She visited with her gran – Stan’s only daughter, Lois, who passed away in 2017 – when she was a child. “I came to Scotland when I was 12 and we spent three weeks going to different theatres where he performed, to his home, and I remember visiting a pub where his sister worked. Cassidy realised from an early age that her family was different, but it wasn’t until she was 18 she understood how much Stan meant to his fans. “Our house was like a museum, with pictures and statues everywhere. I didn’t know at first if we were really big fans or if this was actually our family! Now Cassidy hopes the film starring Steve Coogan and John C Reilly, which was released on Friday, will introduce Laurel and Hardy to new generations. “I am planning on establishing a film production company for underprivileged kids, as I feel it’s important to continue that family legacy of helping others. “Stan’s number was in the phone book because he wanted to be approachable and to help people follow their passions and dreams. “Stan was always big on treating people equally. “He became one of the biggest stars in the world but he was born a normal guy.